31789 RA6075.jpg 500X638\RA6075.jpg 31790 RA6075_1.jpg 500X638\RA6075_1.jpg Send A Hint! Product Description: less text This crate full of gourmet delights will have the lucky recipient feeling extremely grateful! 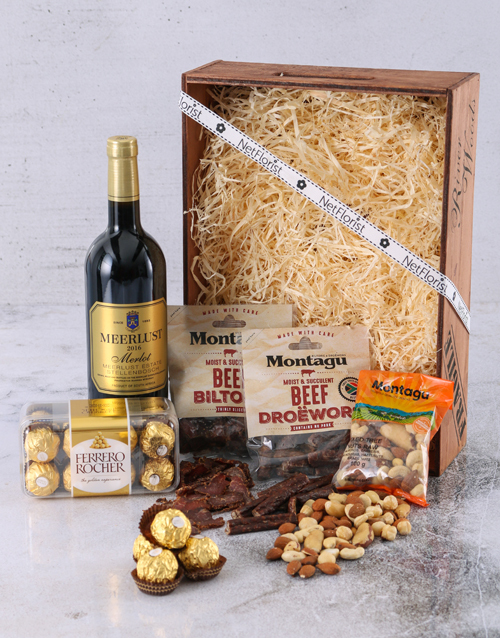 A cooden crate is packed with a bottle of Meerlust Rubicon, Ferrero Rocher Truffles, Sliced Biltong (100g), Droewors (100g), and Mixed Nuts (100g). Send now for any occasion! Get this Meerlust Gourmet Crate delivered with NetFlorist.